Local invented instrument mainstays T.D. Skatchit create top-shelf electro-acoustic aesthetics via old-school hobo gumption. sfSoundGroup make their fancypants orchestral instruments sound like crap, on purpose. T.D. Skatchit (Tom Nunn & David Michalak) – Skatchbox, the Bridgerodstrummer and Coupled String Zither. T.D. Skatchit features Tom Nunn & David Michalak playing the Skatchbox. Built out of cardboard boxes and played with combs, this recession era wonder conjures up a new universe of sound reminiscent of wind, birds singing, frogs croaking and other magical sounds. T.D. Skatchit has released 4 CDs on the Edgetone label. Tonight’s show features new work for skatchbox in collaboration with Kyle Bruckmann and John Ingle. Besides the Skatchbox T.D. 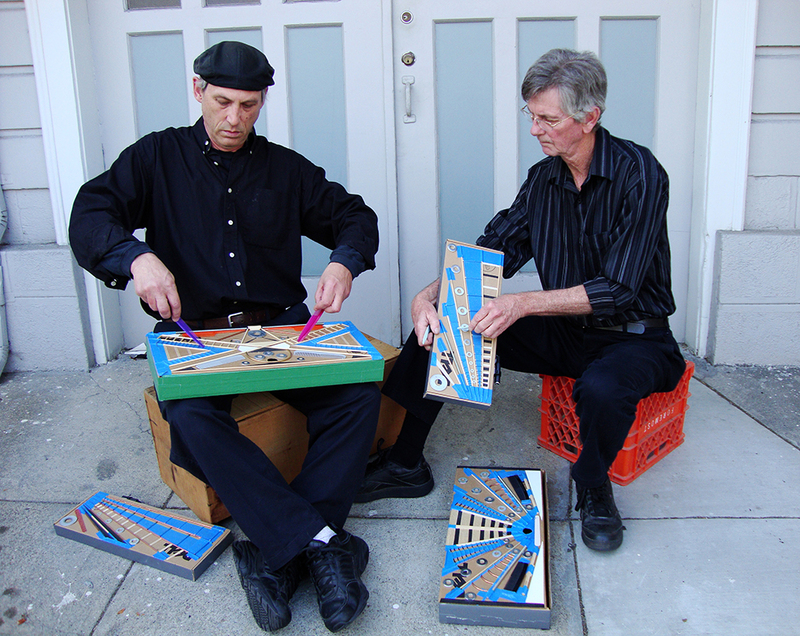 Skatchit will play 2 new Nunn inventions; The Bridgerodstrummer and The Coupled String Zither. sfSoundGroup will perform contemporary compositions by themselves and/or others.